How to relieve constipation quickly: use this breathe-easy exercise to immediately restore your CO2 level closer back to the norm, at which point constipation does occur. First, consider these basic principles of breathing, which are utterly overlooked by the majority of the populace, including those with official degrees in medicine. The more a person breathes, the less CO2 remains in the lungs. Surprising fact: CO2 is largely responsible for getting oxygen into body cells. This is important effect is pictured left, in the example of oxygen in the brain, with the lighter colors representing oxygen. 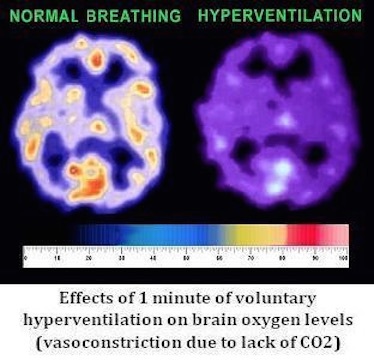 Hyperventilation (breathing more than the [tiny] norm) blows out CO2 and ultimately deprives the body of oxygen. A lack of oxygen, on a cell level, is the cause of all chronic disease. This is reported in The Textbook of Medical Physiology by A. C. Guyton, the most widely used medical textbook in the entire world. Overbreathing, then, is at the root of chronic disease and many other abnormalities, not excluding constipation. You are suffering sitting on the toilet. To get constipation relief, after your normal exhalation, pinch your nose closed so as to hold your breath. The mouth was designed by Nature to be closed whenever possible, so we are assuming that it is not open for this exercise. After some number of seconds (probably less than 20), you will experience an initial stress to breathe. This result (after resting for about 7 minutes, while sitting, after a usual exhale, until the first distinct desire to breathe, measured in seconds) is actually an important parameter, namely the body oxygen level. For long-term relief from constipation, we will work on getting this body oxygen result longer, reflecting a slower breathing pattern. But now, you are in pain and an immediate solution, so extend your breath holding beyond your body oxygen level so as to develop a strong desire to breathe. This breath hold will accumulate CO2 in your body, which CO2 is important for smooth-muscle relaxation, which you are currently lacking, hence your situation. After the breath hold, release your nose and take a smaller inhalation than normal, while doing your best to relax despite your body’s tendency to become tense. Eliminating a Magnesium deficiency may also lead to better relaxation, enabling you to better do this exercise for constipation and itself playing a (minor) rule in helping with constipation. During this exercise, only relax for exhales and continue taking smaller-than-normal inhales while being relaxed. The picture below visualizes our goal here. In as little as one minute, you may experience a pleasant easy bowel movement. Sometimes, this exercise needs to be repeated for success. In some cases, individual factors may interfere with being able to reduce one’s breathing. This YouTube video provides a quick constipation relief: over 100,000 views with great testimonials and reviews.